I've been having a play with the new point cluster renderer in QGIS 3.0.2 and it's great - a lot easier (and faster) than having to do the clustering yourself. To show what I mean, here's an example of road accidents in Edinburgh using STATS19 data and a 30m radius. I can't work out how to set up the z-order so that the largest clusters are drawn in front of smaller clusters. I'm aware of the @cluster_size variable - it's what I'm using to scale and colour the symbols. For this I'm using the size and colour assistants. I removed the font markers to remove the text from each cluster. Symbol Levels - No luck; unable to select a variable name. Layer rendering > Control Feature Rendering Order and choose @cluster_size as sort. Doesn't appear to have an effect. Graduated style using @cluster_size as the expression doesn't work. Does anyone know if this is possible, or is this a limitation with this particular renderer? It seems as though the point cluster implementation does not allow for this natively. Consider the point cluster renderer - it essentially analyzes and clusters point data at render time, creating a new pseudo layer. This layer is not accessible to the user. One cannot query a clustered point. One cannot field calculate a @cluster_size attribute. The point cluster renderer does inherit render order from the source using Control feature rendering order (QgsFeatureRequest::OrderByClause) leaving open the possibility of some clever workaround using attributes and expressions, however certain ordering schemes are not guaranteed to be consistent. As an example, consider a point layer with rendering ordered ascending by a "Latitude" attribute. The more northerly points are rendered atop more southerly points. The point cluster renderer does not have a "Latitude" attribute for its new features, though it will inherit some semblance of that order from the source. There can be instances when a more southerly cluster renders atop a more northerly cluster, because of the order of the original points. Not the answer you're looking for? Browse other questions tagged qgis clustering qgis-3 rendering or ask your own question. 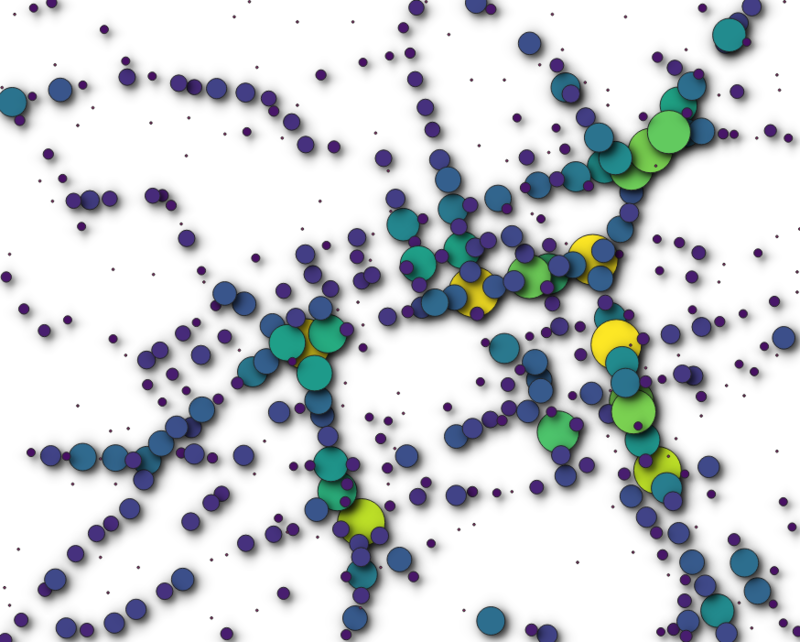 How can I GROUP BY linear spatial clusters with PostGIS?